Carrying out roofing repairs, whether it is slates, tiles, or for that matter, flat roof repairs, can be a daunting prospect for any property owner who thinks he has a roofing repairs and maintenance problem. Most of the roof repairs that we undertake are triggered by house-owners or property landlords that notice damp from within the inside of a property. Quite often they don’t recognise damp and perished plaster, or rotten window frames as a roof problem, or for that matter a gutter repair issue, but it often can be. Based in Hale (near Heald Green and Gatley) AC Joinery can discuss any roofing issues that you may have, either pitched roof or flat roof – we’re sure we can help. One of the more difficult roofing repair problems is actually to identify where the damp showing on chimney breast, that is discolouring the decor sometimes, is coming from. This damage canbe caused by missing roof tiles, or a badly pointed chimney stack, but most often it is from the lead flashing (or lack of it), arround the base of a chimney, where it meets the roof – this can allow penitrative damp to cause serious damage. We can inspect for roofing repairs (slates, tiles), and see if any slates or tiles are missing, and also inspect the chimney breast (eg. is the pointing in good order, are the chimney cowls broken or misssing) as all these can result in moisture penetration. 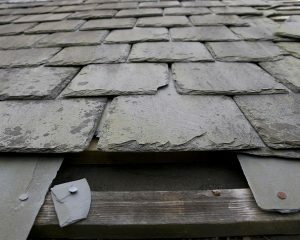 Irrespective of which roofing repairs, slates, tiles, or flat roofs you need, just give us a call. If you live in Manchester, Altrincham, near Alderly Edge and Wilmslow we can give you a quote to carry out any roofing repairs of slates & tiles.